Self build, although demanding, can be very creative and great fun, especially the design part. it may be the only way to get what you want. you achieve a kind of creative act that you can do in very few realms of your life. Before buying a plot of land you need to have an idea of what you want to build in terms of area, volume, cost etc. just to make sure you don’t acquire land which will not accommodate your needs. Bear in mind that a quirky site might pose challenges but it might also suggest unique design possibilities which will enhance the final design (although probably at extra cost). You might find that before purchasing the land it is worth doing some outline sketches of what you want to build (either yourself or by employing an architect) and then showing them to the local planners to get their reaction. noise[for the purposes of part E of the Approved Documents] - Noise is unwanted sound. imaginative spaces, colours, lighting, views etc. feeling inviting, cosy, relaxing, stimulating, secure etc. modernism with all its myriad forms. This is a vast subject. At its heart are the notions of visual honesty, spaciousness and progress. There is the maxim ‘form follows function’. Modernism may be closely associated with the basic functions of a house (see above) as functionalism often creates its own set of visual references. It may also only be a veneer of whatever appears to be cool or trendy at the time with little relationship to the real needs of people. This is a failure of real functionalism and there are plenty of examples from the last century, particularly the 1970s where ‘form swallows function’. At present, for instance, there is a fashion for white rendered walls with panels of smooth brown boarding dotted around, and virtually no roof overhang. This is what is perceived as modernist but does little in terms of function for protection of timber windows and doors. a statement about the interests and ideals of the designer / builder. People sometimes incorporate symbols of what they hold dear into the design. For instance the prominent placing of a garage or swimming pool or a stable may indicate what that person’s interests are all about. a statement of individualism, idiosyncrasy, eccentricity, rebellion or whimsy. conforming to norms. This has several aspects to it which overlap and get quite messy. Conforming to what the planners want. 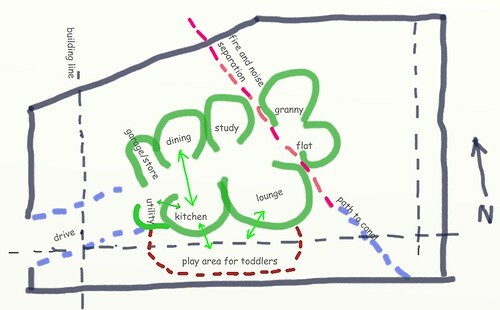 Planners want an easy life. In most cases planners work quite democratically but usually to a kind of ‘lowest common denominator’. When neighbours object to what you want to build (and often many of them do) the planners try to get rid of any contentious bits to placate the objectors. These may also be the most interesting bits. It creates institutionalised boredom. What will the neighbours think? Maybe there is that fear of being branded as those weirdos who built that strange looking house. Will it be saleable? Well maybe there is nobody out there who has your strange creative taste. National conservatism (small c). All this can add up to a strange kind of atmosphere where imagination is frowned on and innovation discouraged. Well have a look out there! And then strengthen your resolve to create something you are proud of. If the above two aspects of design (basic function and aesthetics) are the only ones you consider then you are liable to miss the mark. Design aesthetics, when not deeply linked to the context of the building, risk being a fashion fad and the whole idea of the function of a building simply being a set of boxes to eat, wash and sleep in is a shallow approach to design. The quality without a name (to use Christopher Alexander’s phrase in A Pattern Language is what makes a building really feel alive and function at a deep level. See more on A Pattern Language. cash flow, stage payments etc. Become as sensitive as you can to the place where you intend to build. Get a feel of the closeness and relationship with neighbours and surrounding buildings and how noisy it may be. Check what security feels like. See where the sun comes from and where the best and worst views are. Bear in mind that the Building RegulationsThese are the mass of regulations that cover safety, health, welfare, convenience, energy efficiency etc. in the way buildings are constructed. Not to be confused with Planning consent (which is more to do with whether you can put up the building in the first place). See more on the regulations have quite complex rules about proximity of other buildings and how this affects fire resistance[for the purposes of part B of the Approved Documents] - The ability of a component or construction of a building to satisfy, for a stated period of time, some or all of the appropriate criteria specified in the relevant part of BSBritish Standard 476. of the structure. Take photographs to help with the design process later. Find out what the soil is like and what grows there and what kind of local wildlife there is. Retaining walls are usually designed by the structural engineer but you will be free to say what type you want and there are basically three types which avoid using reinforced concrete with its high embodied energythe total amount of energy it takes to make a material (or a building). See more on embodied energy. These are gabionsThese are wire cages (often about a meter cube) filled with stones. You see them protecting river banks, acting as retaining walls and, more recently as walls in buildings, reclaimed sleepers and crib timber systems. There are several aspects of below-ground work which may be improved on from a green perspective. Often there is not enough thought put into how to use the natural contours of the site. Rather the temptation is to design in huge amounts of concrete to ‘flatten’ out a sloping site or to construct large concrete retaining walls to hold back land. There may be several good green reasons for serious earth moving operations and although there is an almost inevitable use of fossil fuel the benefits might far outweigh this problem. make a list of all the basic areas and functions that you envisage being in and round the house. 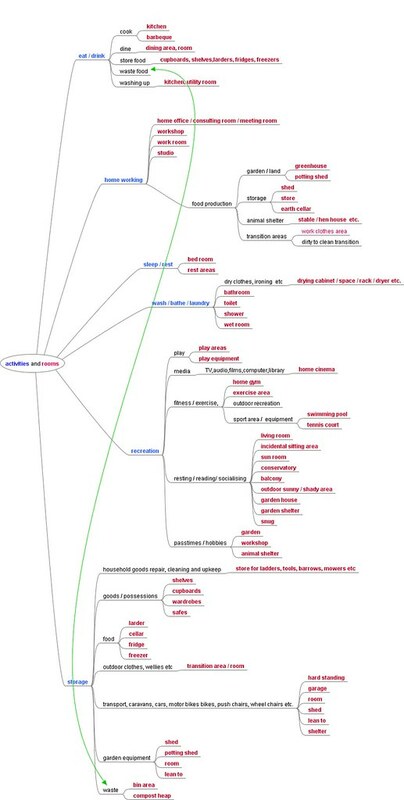 Here is a picture of a mind map created in Freemind. It works as a checklist. You can do your own by downloading Freemind (a free open source program). It’s very intuitive to use: you can build up associated groups of things and then cross reference them. Write your own Pattern Language using the approach outlined in the book and on the web site. A Pattern Language is an excellent approach to design. At worst it will help you avoid some of the major design pitfalls. At best it will help you create a beautiful, living, harmonious building. Another remarkably effective way of getting to grips with how a building might fit on a site is to go and mark it out on the site with poles or canes and lengths of string, preferably to the height it might finally be and then place large stones or whatever to mark out areas around the building. This is a flexible creative way of envisioning the scale and modeling of a house which takes into account its surroundings: a method greatly favoured by the ‘Pattern Language‘ approach. As your design develops you may want to try software on the net. Google SketchUp3D modeling software which is an amazing free 3D design and modeling tool which interfaces with Google Earth so that as your design progresses you can see how it looks on the building site. See also SketchupBIM which is a development of Sketchup specially for designing buildings. You can also create models from scratch or from CADcomputer aided design drawings in .DXF or .DWG file types or from photographs. There are plenty of tutorials on Youtube. It can be particularly useful for working out how complex roof shapes interrelate. Another useful free program is Floorplanner which is quite easy to use and allows 3D visualization. With the free version you can go up to 3 storeys and work in metric or imperial. Beware of relying too much on software to do the actual design. It tends to limit your thinking but can be useful to envisage ideas you have come up with. Single storey may work well for anyone with a mobility disability. Lifts can me obtrusive and expensive. There may be aesthetic reasons for staying low or going higher. Planning permissionthe legal basis for being allowed to do some form of development such as building a house. (not to be confused with Building Regulations which are all about whether the building is properly constructed). see more on Planning the legal basis for being allowed to do some form of development such as building a house. (not to be confused with Building Regulations which is all about whether the building is properly constructed). see more on Planning may involve fitting in with the surrounding building types, especially in sensitive areas. The task of designing and building single storey is relatively simple: structural aspects are generally simpler and fire protection is very little of an issue. The same goes for scaffolding and working at height. With two storey, fire resistance and means of escape[for the purposes of part B of the Approved Documents] - Structural means whereby [in the event of fire] a safe route or routes is or are provided for persons to travel from any point in a building to a place of safety. start to become important. A modified half hour fire resistant floor construction is needed for the first floor and there are rules about the escape route[for the purposes of part B of the Approved Documents] - Route forming that part of the means of escape from any point in a building to a final exit[for the purposes of part B of the Approved Documents] - The termination of an escape route from a building giving direct access to a street, passageway, walkway or open space, and sited to ensure the rapid dispersal of persons from the vicinity of a building so that they are no longer in danger from fire and/or smoke. Note: Windows are not acceptable as final exits.. down the stairs and to the outside. Habitable rooms at first floor require an emergency egress window. Fire alarms need to be fitted. With three or more storeys the fire regulations become tougher still with requirements for self closing fire resisting doors around the escape route and consideration of the space around the building and how fire fighting equipment gain access. Basements or semi-basements can add extra space to a house and their design is also affected by fire safety. Galleries[for the purposes of part B of the Approved Documents] - A raised area or platform around the sides or at the back of a room which provides extra space., which may include raised bed decks etc. can be attractive and economical features of a house and they also have their showing in the fire regulations. walls. It’s a bit of a sliding scale with walls. 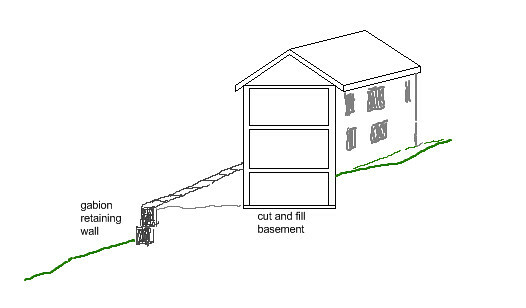 If you are using heavy load bearing masonry then walls must go in a vertical plane from foundations to roof. You can deviate a little if you incorporate structural steelwork. At the opposite end, timber frame can be designed to follow all sorts of irregular shapes and patterns and give a great deal of freedom in the size and shape of rooms, one above another. Jettying can be included. In the middle is SIPsStructural Insulated Panels - prefabricated (usually in a factory) timber panels often forming part of an integrated building system and aimed at fast site erection. see more on SIPs where walls can be supported on structural timber members and can be designed to overhang to some extent. consider how all this might affect the design of roofs and where fall pipes can be placed to connect gutters to drains. get an idea how windows will need to be positioned and what kind of views they will afford. By now you will probably have done some sketches of elevations to see how walls, roofs and windows line up. Cardboard or balsa wood models are an excellent way of visualising how all the bits come together. They don’t have to be perfect to give you an idea of how different parts of a building relate to each other. When you are getting close to a design you like you can print off drawings of the floors and walls and then glue them to card. Cut out the shapes and glue them together to produce a more accurate model. At this stage you may feel you need professional help to knit all this together accurately. Often the devil is in the detail and it takes considerable experience to make sure everything fits together correctly. See Architects and Architectural Technologists. However if you want to continue then you will need to start doing some accurate drawings and although a traditional drawing board and tee square are fine, it is difficult to make changes as you go along. Better is a CAD program, and there are several free ones available for download on the Internet. Probably better to go for a lightweight 2D version than any of the industry leaders like AutoCad, which take a long time to learn. Try A9CAD and B4UBUILD.com who have lots of information on CAD and object oriented design software. There is some Sketchup 3D modelling software for designing small (up to 30m² floor area) garden sheds, tiny houses etc. using the Segalrefers to a simple self build timber frame form of construction pioneered by the architect Walter Segal. see details of the system self build method. Yes of course, that’s where the devil is and it can be very difficult to get hold of good working detail drawings. With the much higher standards of insulation and air tightnessA measure of how leaky a building is to air. In other words, how draughty it might be. There are now standard fan pressure tests to check how air tight a house is and the Building Regulations have minimum standards for all new houses (L1A – Conservation of fuel and power in new dwellings (England)). A much higher degree of air tightness is covered by the Passivhaus standard required by eco building, most of the traditional books on construction are hopelessly out of date. Even agencies like TRADATimber Research and Development Association A trade association with a strong reputation for research and publication on all things timber are struggling to update their literature. In stark contrast to this is the high standard approach of the Passivhaus Institute which integrates how building products are assessed and then how they physically relate to each other. It is often possible to pick up information from manufacturers’ literature as to how their product connects to other parts of the building fabric. There is a useful online Wiki called Designing Buildings Wiki which approaches self build from the the building professional’s point of view and contains a section on the government’s policy of supporting self build self build. See the Lifetime Homes web site for design criteria.